So I hatched a plan to entertain myself and our neighbors by putting together a hot pot dinner on Tuesday night when we were all supposed to be shut in. 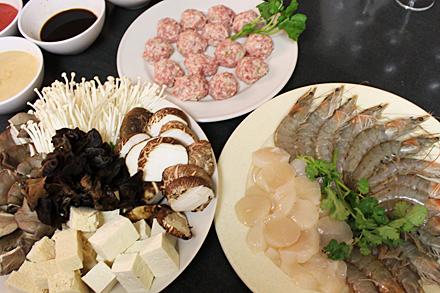 On Monday morning, before the snow started accumulating, I hurried down to Chinatown and bought a whole bunch of ingredients suitable for hot pot cooking. Since there was already some beef tenderloin, chicken breast and boneless leg of lamb in our freezer, I didn’t bother getting more meat. But at a fishmonger I found some beautiful Maryland blue crabs and plump mussels from Massachusetts. At another market I bought flounder filet, fresh head-on prawns and beautiful fresh scallops. I knew then this was going to be a seafood laden hot pot meal, which was just fine with me. For vegetables I bought napa cabbage, watercress, chrysanthemum greens, fresh shiitake mushrooms, oyster mushrooms, enoki mushrooms, mountain yam and lotus roots. Finally, to round out the ingredients I bought some quail eggs, tofu, egg noodles and glass noodles. But I still had not decided what kind of soup stock I was going to put in the pot. That is until I saw out of the corner of my eyes some oxtail in the butcher’s display case. I knew I could make a spicy oxtail stock for one side of the pot and a simple chrysanthemum Chicken broth in the other. You see we have one of these pots that contain two compartments for stock and it’s called Mandarin duck hot pot, named after the bird that mate for life and are inseparable. 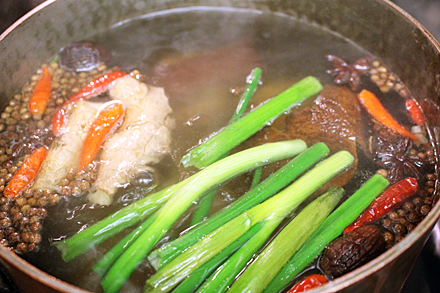 Flavored by star anise, Sichuan peppercorns, cassia bark, black cardamom and chili peppers, the oxtail stock was a fragrant and slightly spicy broth, and would contrast well with the mild chicken stock on the other side. On Monday night I made the stock and prepared fish paste and beef paste to make meatballs, thinking that I could spend Tuesday morning while the storm raged on to slice the meat and cut up the vegetables. On Tuesday morning when I woke up, there was barely any snow on the ground. The epic snowstorm turned out to be a dud. In the end we only received about ten inches of snow from the storm. 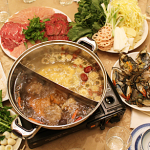 But a hot pot meal is always welcome on a cold winter night, snow or no snow. Our appreciative neighbors thought so too. Put the oxtail with enough cold water to cover completely in an 8-quart stockpot. Bring the liquid to a gentle boil and cook for about 5 minutes. Drain and discard the liquid. 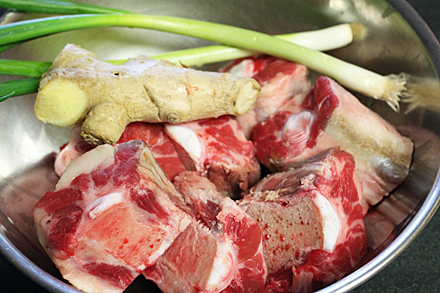 Rinse the oxtail under cold running water to remove any scum from parboiling. Return the oxtail to the pot, add the rest of the ingredients and 4 quarts water, and slowly bring to a simmer over low heat. Skim off any scum that forms on top of the liquid. Simmer uncovered for 2 hours. 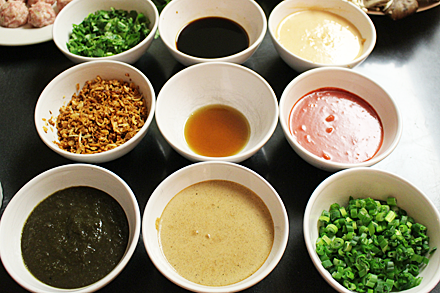 There is no need to season the stock since the hot pot is served with dipping sauces. Put about one third of the oxtail stock, along with a few pieces of the oxtail, in the hot pot at the beginning, then replenish as the meal progresses. I came here to look for your red pork recipe but got sidelined by this post. 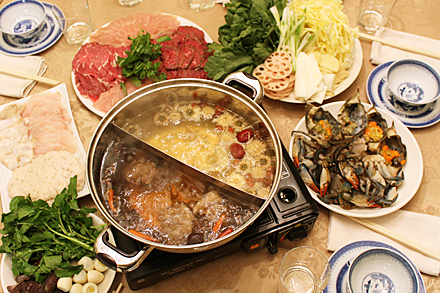 How did you know I’ve been obsessing about hot pot lately? Do you know what brand of pot you have (or where you bought it?) I’ve been looking at one on Amazon but the reviews are mixed. Also – do you use a gas burner or hot plate set up? I like the burner but have a one year old and would rather not kill us with carbon monoxide. Thank you! Thanks for visiting Red Cook. 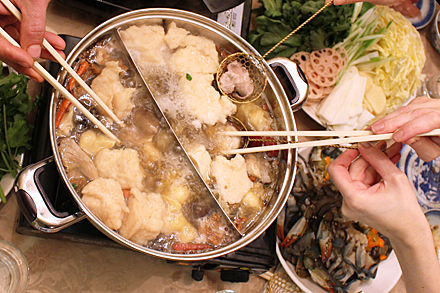 Our hot pot is standard double compartment stainless steel type and we’re very satisfied with it. No brand name. You can get them from many on-line sites. It is quite easy to maintain and offers good heat conduction from the stove. As for heat source I definitely recommend butane stove. 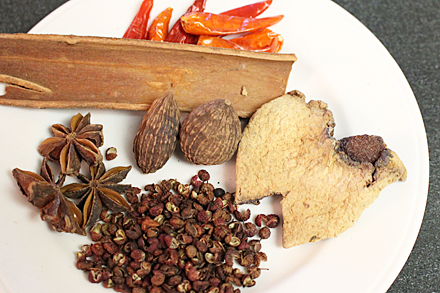 They are safe for home use and is powerful enough to keep the broth hot for cooking. Electric stove is usually too slow in bringing the liquid up to boil when raw ingredients are added. Be sure to follow manufacturer’s instructions when using any stove.